Supporters of Anjan Kumar Yadav disrupted a meeting of party's Greater Hyderabad unit on Monday, shouting slogans against Mohammed Azharuddin. 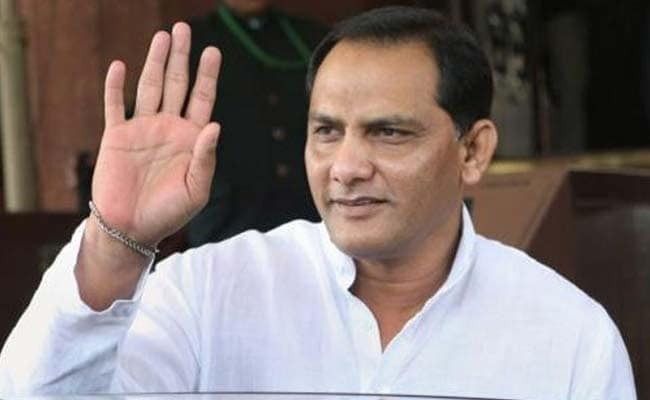 Former Indian cricket captain Mohammad Azharuddin's plans to contest from Secunderabad Lok Sabha seat threw the Congress party into turmoil on Monday, with the former lawmaker Anjan Kumar Yadav declaring that he will not give up his claim to the constituency. Supporters of Mr Yadav disrupted a meeting of party's Greater Hyderabad unit on Monday, shouting slogans against Azharuddin. They opposed any move to field the former cricketer from Secunderabad. Mr Yadav's group resorted to the protest in presence of All India Congress Committee (AICC) secretary NS Bose Raju and President of party's Telangana unit Uttam Kumar Reddy. Former Union Minister Sarve Satyanarayana tried to pacify the protestors by stating that Secunderabad seat belongs to Mr Yadav. Amid the chaos, senior party leader V. Hanumantha Rao left the meeting in a huff. Later, Mr Yadav, who was recently appointed as the president of party's Greater Hyderabad unit, told reporters that he will contest from Secunderabad Lok Sabha constituency in the coming elections. Mr Yadav was elected from Secunderabad constituency in 2004 and 2009 but lost to BJP's Bandaru Dattatreya in 2014. The Congress leader said he would extend support to Azharuddin if he contests from Hyderabad Lok Sabha constituency. In the previous elections, Mr Azharuddin's name was doing rounds as possible candidate from Hyderabad Lok Sabha constituency, which is represented by Majlis-e-Ittehadul Muslimeen (MIM) President Asaduddin Owaisi. However, the cricketer was reluctant to contest from Hyderabad, a seat held by MIM for over three decades. Mr Azharuddin had reportedly said on Sunday that he is keen to contest from Secunderabad, as people feel that he should contest elections in his home town. He said he had conveyed this to party's state leadership and central leader incharge of party affairs in the state. Mr Azharuddin was elected to Lok Sabha from Muradabad constituency in Uttar Pradesh on the Congress ticket in 2009. He contested unsuccessfully from Tonk-Sawai Madhopur in Rajasthan in 2014.